Indian society, polity and economy had shown remarkable resilience in adjusting with the structural reforms. GDP growth at 6.3% in the second quarter signaled turnaround of the economy. We hope to grow at 7.2% to 7.5% in the second half, said Arun Jaitley. Madam Speaker, our Government was elected amidst huge expectations of the people. The underlying theme of countless expectations was good governance. The expectations included burning issues like inflation and price rise, corruption in day to day transactions and crony capitalism. There was also expectation for a major change in the way the country’s natural resources were allocated, processed and deployed. From informal economy to formal economy. We shall continue to undertake many more measures to ensure that the fruits of growth reach the farmers, the workers, the poor, the scheduled castes and scheduled tribes, women and other vulnerable sections of our society. Our focus will be on energising our youth to reap the benefits of growth and employment. Madam Speaker, I am presenting this Budget when the world economy faces considerable uncertainty, in the aftermath of major economic and political developments during the last one year. Nevertheless, the International Monetary Fund (IMF) estimates that world GDP will grow by 3.1% in 2016 and 3.4% in 2017. The advanced economies are expected to increase their growth from 1.6% to 1.9% and the emerging economies from 4.1% to 4.5%. As per current indications, macro-economic policy is expected to be more expansionary in certain large economies. Growth in a number of emerging economies is expected to recover in 2017, after relatively poor performance in 2016. These are positive signs and point to an optimistic outlook for the next year. There are, however, three major challenges for emerging economies. First, the current monetary policy stance of the US Federal Reserve, to increase the policy rates more than once in 2017, may lead to lower capital inflows and higher outflows from the emerging economies. Second, the uncertainty around commodity prices, especially that of crude oil, has implications for the fiscal situation of emerging economies. It is however expected that increase, if any, in oil prices would get tempered by quick response from producers of shale gas and oil. This would have a sobering impact on prices of crude and petroleum. Third, in several parts of the world, there are signs of increasing retreat from globalisation of goods, services and people, as pressures for protectionism are building up. These developments have the potential to affect exports from a number of emerging markets, including India. Amidst all these developments, India stands out as a bright spot in the world economic landscape. India’s macro-economic stability continues to be the foundation of economic success. CPI inflation declined from 6% in July 2016 to 3.4% in December, 2016 and is expected to remain within RBI’s mandated range of 2% to 6%. Favourable price developments reflect prudent macro-economic management, resulting in higher agricultural production, especially in pulses. India’s Current Account Deficit declined from about 1% of GDP last year to 0.3% of GDP in the first half of 2016-17. Foreign Direct Investment (FDI) increased from ` 1,07,000 crores in the first half of last year to ` 1,45,000 crores in the first half of 2016-17. This marks an increase by 36%, despite 5% reduction in global FDI inflows. Foreign exchange reserves have reached 361 billion US Dollars as on 20th January, 2017, which represents a comfortable cover for about 12 months of imports. A number of global reports and assessments, over the last two years, have shown that India has considerably improved its policies, practices and economic profile. These are reflected in Doing Business Report of the World Bank; World Investment Report 2016 of UNCTAD; Global Competitiveness Report of 2015-16 and 2016-17 of the World Economic Forum; and several other Reports. India has become the sixth largest manufacturing country in the world, up from ninth previously. We are seen as an engine of global growth. In the last one year, our country has witnessed historic and impactful economic reforms and policy making. In fact, India was one of the very few economies undertaking transformational reforms. There were two tectonic policy initiatives, namely, passage of the Constitution Amendment Bill for GST and the progress for its implementation ; and demonetisation of high denomination bank notes. The advantages of GST for our economy in terms of spurring growth, competitiveness, indirect tax simplification and greater transparency have already been extensively discussed in both Houses of Parliament. I thank all Members of both the Houses for having passed the Constitution Amendment unanimously. I also thank the State Governments for resolving all relevant issues in the GST Council. Demonetisation of high denomination bank notes was in continuation of a series of measures taken by our Government during the last two years. It is a bold and decisive measure. For several decades, tax evasion for many has become a way of life. This compromises the larger public interest and creates unjust enrichment in favour of the tax evader, to the detriment of the poor and deprived. This has bred a parallel economy which is unacceptable for an inclusive society. Demonetisation seeks to create a new ‘normal’ wherein the GDP would be bigger, cleaner and real. This exercise is part of our Government’s resolve to eliminate corruption, black money, counterfeit currency and terror funding. Like all reforms, this measure is obviously disruptive, as it seeks to change the retrograde status quo. Drop in economic activity, if any, on account of the currency squeeze during the remonetisation period is expected to have only a transient impact on the economy. I am reminded here of what the Father of the Nation, Mahatma Gandhi, had said: “A right cause never fails”. Demonetisation has strong potential to generate long-term benefits in terms of reduced corruption, greater digitisation of the economy, increased flow of financial savings and greater formalisation of the economy, all of which would eventually lead to higher GDP growth and tax revenues. Demonetisation helps to transfer resources from the tax evaders to the Government, which can use these resources for the welfare of the poor and the deprived. There is early evidence of an increased capacity of Banks to lend at reduced interest rates and a huge shift towards digitisation among all sections of society. We firmly believe that demonetisation and GST which were built on the third transformational achievement of our Government, namely, the JAM vision, will have an epoch making impact on our economy and the lives of our people. Madam Speaker, we are at an important turning point in the path of our growth and development. The pace of remonetisation has picked up and will soon reach comfortable levels. The effects of demonetisation are not expected to spill over into the next year. Thus IMF, even while revising India’s GDP forecast for 2016 downwards, has projected a GDP growth of 7.2% and 7.7% in 2017 and 2018 respectively. The World Bank, however, is more optimistic and has projected a GDP growth of 7% in 2016-17, 7.6% in 2017-18 and 7.8% in 2018-19. This pick up in our economy is premised upon our policy and determination to continue with economic reforms; increase in public investment in infrastructure and development projects; and export growth in the context of the expected rebound in world economy. The surplus liquidity in the banking system, created by demonetisation, will lower borrowing costs and increase the access to credit. This will boost economic activity, with multiplier effects. The announcements made by Honourable Prime Minister on 31st December, 2016 address many of the key concerns of our economy at this juncture, such as, housing for the poor; relief to farmers; credit support to MSMEs; encouragement to digital transactions; assistance to pregnant women and senior citizens; and priority to dalits, tribals, backward classes and women under the Mudra Yojana. My overall approach, while preparing this Budget, has been to spend more in rural areas, infrastructure and poverty alleviation and yet maintain the best standards of fiscal prudence. I have also kept in mind the need to continue with economic reforms, promote higher investments and accelerate growth. The last one year was a witness to other major reforms, namely, enactment of the Insolvency and Bankruptcy Code; amendment to the RBI Act for inflation targeting; enactment of the Aadhar bill for disbursement of financial subsidies and benefits; significant reforms in FDI policy; the job creating package for textile sector; and several other measures. We will continue the process of economic reforms for the benefit of the poor and the underprivileged. Madam Speaker, the Budget for 2017-18 contains three major reforms. First, the presentation of the Budget has been advanced to 1st February to enable the Parliament to avoid a Vote on Account and pass a single Appropriation Bill for 2017-18, before the close of the current financial year. This would enable the Ministries and Departments to operationalise all schemes and projects, including the new schemes, right from the commencement of the next financial year. They would be able to fully utilise the available working season before the onset of the monsoon. Second, the merger of the Railways Budget with the General Budget is a historic step. We have discontinued the colonial practice prevalent since 1924. This decision brings the Railways to the centre stage of Government’s fiscal policy and would facilitate multi modal transport planning between railways, highways and inland waterways. The functional autonomy of Railways will, however, continue. Third, we have done away with the plan and non-plan classification of expenditure. This will give us a holistic view of allocations for sectors and ministries. This would facilitate optimal allocation of resources. Tax Administration : honouring the honest. The Indian farmer has once again shown his commitment and resilience in the current year. The total area sown under kharif and rabi seasons are higher than the previous year. With a better monsoon, agriculture is expected to grow at 4.1% in the current year. In last year’s Budget speech, I focused on ‘income security’ of farmers to double their income in 5 years. I had also announced a number of measures. We have to take more steps and enable the farmers to increase their production and productivity; and to deal with post-harvest challenges. For a good crop, adequate credit should be available to farmers in time. The target for agricultural credit in 2017-18 has been fixed at a record level of ` 10 lakh crores. We will take special efforts to ensure adequate flow of credit to the under serviced areas, the Eastern States and Jammu & Kashmir. The farmers will also benefit from 60 days’ interest waiver announced by Honourable Prime Minister in respect of their loans from the cooperative credit structure. About 40% of the small and marginal farmers avail credit from the cooperative structure. The Primary Agriculture Credit Societies (PACS) act as the front end for loan disbursements. We will support NABARD for computerisation and integration of all 63,000 functional PACS with the Core Banking System of District Central Cooperative Banks. This will be done in 3 years at an estimated cost of ` 1,900 crores, with financial participation from State Governments. This will ensure seamless flow of credit to small and marginal farmers. Rs1,41,625 crores in Kharif 2016. Issuance of Soil Health Cards has gathered momentum. The real benefit to farmers would be available only when the soil samples are tested quickly and nutrient level of the soil is known. Government will therefore set up new mini labs in Krishi Vigyan Kendras (KVKs) and ensure 100% coverage of all 648 KVKs in the country. In addition, 1000 mini labs will be set up by qualified local entrepreneurs. Government will provide credit linked subsidy to these entrepreneurs. A Long Term Irrigation Fund has already been set up in NABARD. Honourable Prime Minister has announced an addition of Rs20,000 crores to its corpus. This will take the total corpus of this Fund to Rs40,000 crores. A dedicated Micro Irrigation Fund will be set up in NABARD to achieve the goal, ‘per drop more crop’. The Fund will have an initial corpus of Rs5,000 crores. For the post-harvest phase, we will take steps to enable farmers to get better prices for their produce in the markets. The coverage of National Agricultural Market (e-NAM) will be expanded from the current 250 markets to 585 APMCs. Assistance up to a ceiling of Rs75 lakhs will be provided to every e-NAM market for establishment of cleaning, grading and packaging facilities. This will lead to value addition of farmers’ produce. Market reforms will be undertaken and the States would be urged to denotify perishables from APMC. This will give opportunity to farmers to sell their produce and get better prices. We also propose to integrate farmers who grow fruits and vegetables with agro processing units for better price realisation and reduction of post-harvest losses. A model law on contract farming would therefore be prepared and circulated among the States for adoption. Dairy is an important source of additional income for the farmers. Availability of milk processing facility and other infrastructure will benefit the farmers through value addition. A large number of milk processing units set up under the Operation Flood Programme has since become old and obsolete. A Dairy Processing and Infrastructure Development Fund would be set up in NABARD with a corpus of Rs8,000 crores over 3 years. Initially, the Fund will start with a corpus of Rs2,000 crores. Over Rs3 lakh crores are spent in rural areas every year, if we add up all the programmes meant for rural poor from the Central Budget, State Budgets, Bank linkage for self-help groups, etc. With a clear focus on improving accountability, outcomes and convergence, we will undertake a Mission Antyodaya to bring one crore households out of poverty and to make 50,000 gram panchayats poverty free by 2019, the 150th birth anniversary of Gandhiji. We will utilise the existing resources more effectively along with annual increases. This mission will work with a focused micro plan for sustainable livelihood for every deprived household. A composite index for poverty free gram panchayats would be developed to monitor the progress from the baseline. Honourable Members would be happy to note that the budget provision of Rs38,500 crores under MGNREGA in 2016-17 has been increased to Rs48,000 crores in 2017-18. This is the highest ever allocation for MGNREGA. The initiative to geo-tag all MGNREGA assets and putting them in public domain has established greater transparency. We are also using space technology in a big way to plan MGNREGA works. The Pradhan Mantri Gram Sadak Yojana (PMGSY) is now being implemented as never before. The pace of construction of PMGSY roads has accelerated to reach 133 km roads per day in 2016-17, as against an average of 73 km during the period 2011-2014. We have also taken up the task of connecting habitations with more than 100 persons in left wing extremism affected Blocks. We have committed to complete the current target under PMGSY by 2019. I have provided a sum of Rs19,000 crores in 2017-18 for this scheme. Together with the contribution of States, an amount of Rs27,000 crores will be spent on PMGSY in 2017-18. We propose to complete 1 crore houses by 2019 for the houseless and those living in kutcha houses. I have stepped up the allocation for Pradhan Mantri Awaas Yojana – Gramin from Rs15,000 crores in BE 2016-17 to Rs23,000 crores in 2017-18. We are well on our way to achieving 100% village electrification by 1st May 2018. An increased allocation of Rs4,814 crores has been proposed under the Deendayal Upadhyaya Gram Jyoti Yojana in 2017-18. I have also proposed to increase the allocations for Deendayal Antyodaya Yojana- National Rural Livelihood Mission for promotion of skill development and livelihood opportunities for people in rural areas to Rs4,500 in 2017-18. The allocation for Prime Minister's Employment Generation Programme (PMEGP) and credit support schemes has been increased more than 3 times. Swachh Bharat Mission (Gramin) has made tremendous progress in promoting safe sanitation and ending open defecation. Sanitation coverage in rural India has gone up from 42% in October 2014 to about 60%. Open Defecation Free villages are now being given priority for piped water supply. We propose to provide safe drinking water to over 28,000 arsenic and fluoride affected habitations in the next four years. This will be a sub mission of the National Rural Drinking Water Programme (NRDWP). Panchayati raj institutions still lack human resources for implementing development programmes. A programme of “human resource reforms for results” will be launched during 2017-18 for this purpose. The Government will continue to work closely with the farmers and the people in the rural areas to improve their life and environment. This is a non-negotiable agenda for our Government. The total allocation for the rural, agriculture and allied sectors in 2017-18 is Rs1,87,223 crores, which is 24% higher than the previous year. Let me now focus on my proposals for the youth. We have proposed to introduce a system of measuring annual learning outcomes in our schools. Emphasis will be given on science education and flexibility in curriculum to promote creativity through local innovative content. In higher education, we will undertake reforms in the UGC. Good quality institutions would be enabled to have greater administrative and academic autonomy. Colleges will be identified based on accreditation and ranking, and given autonomous status. A revised framework will be put in place for outcome based accreditation and credit based programmes. We propose to leverage information technology and launch SWAYAM platform with at least 350 online courses. This would enable students to virtually attend the courses taught by the best faculty; access high quality reading resources; participate in discussion forums; take tests and earn academic grades. Access to SWAYAM would be widened by linkage with DTH channels, dedicated to education. We propose to establish a National Testing Agency as an autonomous and self-sustained premier testing organisation to conduct all entrance examinations for higher education institutions. This would free CBSE, AICTE and other premier institutions from these administrative responsibilities so that they can focus more on academics. We have a huge demographic advantage. Skill India mission was launched in July 2015 to maximise the potential of our youth. In 2017-18, we also propose to launch the Skill Acquisition and Knowledge Awareness for Livelihood Promotion programme (SANKALP) at a cost of Rs4,000 crores. SANKALP will provide market relevant training to 3.5 crore youth. The next phase of Skill Strengthening for Industrial Value Enhancement (STRIVE) will also be launched in 2017-18 at a cost of Rs2,200 crores. STRIVE will focus on improving the quality and market relevance of vocational training provided in ITIs and strengthen the apprenticeship programmes through industry cluster approach. Tourism is a big employment generator and has a multiplier impact on the economy. Five Special Tourism Zones, anchored on SPVs, will be set up in partnership with the States. Incredible India 2.0 Campaign will be launched across the world. Madam Speaker, I now turn to my proposals for the poor and the underprivileged. Sabka Saath Sabka Vikas begins with the girl child and women. Mahila Shakti Kendra will be set up at village level with an allocation of Rs500 crores in 14 lakh ICDS Anganwadi Centres. This will provide one stop convergent support services for empowering rural women with opportunities for skill development, employment, digital literacy, health and nutrition. A nationwide scheme for financial assistance to pregnant women has already been announced by Honourable Prime Minister on 31st December, 2016. Under this scheme, Rs6,000 each will be transferred directly to the bank accounts of pregnant women who undergo institutional delivery and vaccinate their children. For the welfare of Women and Children under various schemes across all Ministries, I have stepped up the allocation from Rs1,56,528 crores in BE 2016-17 to Rs1,84,632 crores in 2017-18. We propose to facilitate higher investment in affordable housing. Affordable housing will now be given infrastructure status, which will enable these projects to avail the associated benefits. The National Housing Bank will refinance individual housing loans of about Rs20,000 crore in 2017-18. Thanks to the surplus liquidity created by demonetisation, the Banks have already started reducing their lending rates, including those for housing. In addition, interest subvention for housing loans has also been announced by the Honourable Prime Minister. We need to ensure adequate availability of specialist doctors to strengthen Secondary and Tertiary levels of health care. We have therefore decided to take steps to create additional 5,000 Post Graduate seats per annum. In addition, steps will be taken to roll out DNB courses in big District Hospitals; strengthen PG teaching in select ESI and Municipal Corporation Hospitals; and encourage reputed Private Hospitals to start DNB courses. We will work with the State Governments to take these tasks forward. The Government is committed to take necessary steps for structural transformation of the Regulatory framework of Medical Education and Practice in India. We propose to amend the Drugs and Cosmetics Rules to ensure availability of drugs at reasonable prices and promote use of generic medicines. New rules for regulating medical devices will also be formulated. These rules will be internationally harmonised and attract investment into this sector. This will reduce the cost of such devices. We are keen on fostering a conducive labour environment wherein labour rights are protected and harmonious labour relations lead to higher productivity. Legislative reforms will be undertaken to simplify, rationalise and amalgamate the existing labour laws into 4 Codes on (i) wages; (ii) industrial relations; (iii) social security and welfare; and (iv) safety and working conditions. The Model Shops and Establishment Bill 2016 has been circulated to all States for consideration and adoption. This would open up additional avenues for employment of women. The amendment made to the Payment of Wages Act, is another initiative of our Government for the benefit of the labour and ease of doing business. Our Government is giving special importance to implementation of the schemes for welfare of Scheduled Castes, Scheduled Tribes and Minorities. The allocation for the welfare of Scheduled Castes has been stepped up from Rs38,833 crores in BE 2016-17 to Rs52,393 crores in 2017-18, representing an increase of about 35%. The allocation for Scheduled Tribes has been increased to Rs31,920 crores and for Minority Affairs to Rs4,195 crores. The Government will introduce outcome based monitoring of expenditure in these sectors by the NITI Aayog. For senior citizens, Aadhar based Smart Cards containing their health details will be introduced. A beginning will be made through a pilot in 15 districts during 2017-18. The LIC will implement a scheme for senior citizens to provide assured pension, with a guaranteed return of 8% per annum for 10 years. Railways, roads and rivers are the lifeline of our country. I feel privileged to present the first combined Budget of independent India that includes the Railways also. We are now in a position to synergise the investments in railways, roads, waterways and civil aviation. For 2017-18, the total capital and development expenditure of Railways has been pegged at Rs1,31,000 crores. This includes Rs55,000 crores provided by the Government. For passenger safety, a Rashtriya Rail Sanraksha Kosh will be created with a corpus of Rs1 lakh crores over a period of 5 years. Besides seed capital from the Government, the Railways will arrange the balance resources from their own revenues and other sources. Government will lay down clear cut guidelines and timeline for implementing various safety works to be funded from this Kosh. Unmanned level crossings on Broad Gauge lines will be eliminated by 2020. Expert international assistance will be harnessed to improve safety preparedness and maintenance practices. In the next 3 years, the throughput is proposed to be enhanced by 10%. This will be done through modernisation and upgradation of identified corridors. Railway lines of 3,500 kms will be commissioned in 2017-18, as against 2,800 kms in 2016-17. Steps will be taken to launch dedicated trains for tourism and pilgrimage. Railways will implement end to end integrated transport solutions for select commodities through partnership with logistics players, who would provide both front and back end connectivity. Rolling stocks and practices will be customised to transport perishable goods, especially agricultural products. Railways will offer competitive ticket booking facility to the public at large. Service charge on e-tickets booked through IRCTC has been withdrawn. Cashless reservations have gone up from 58% to 68%. As part of accounting reforms, accrual based financial statements will be rolled out by March 2019. In the road sector, I have stepped up the Budget allocation for highways from Rs57,976 crores in BE 2016-17 to Rs64,900 crores in 2017-18. 2,000 kms of coastal connectivity roads have been identified for construction and development. This will facilitate better connectivity with ports and remote villages. The total length of roads, including those under PMGSY, built from 2014-15 till the current year is about 1,40,000 kms which is significantly higher than previous three years. For transportation sector as a whole, including rail, roads, shipping, I have provided Rs2,41,387 crores in 2017-18. This magnitude of investment will spur a huge amount of economic activity across the country and create more job opportunities. Under the BharatNet Project, OFC has been laid in 1,55,000 kms. I have stepped up the allocation for BharatNet Project to Rs10,000 crores in 2017-18. By the end of 2017-18, high speed broadband connectivity on optical fibre will be available in more than 1,50,000 gram panchayats, with wifi hot spots and access to digital services at low tariffs. A DigiGaon initiative will be launched to provide tele-medicine, education and skills through digital technology. For strengthening our Energy sector, Government has decided to set up Strategic Crude Oil Reserves. In the first phase, 3 such Reserves facilities have been set up. Now in the second phase, it is proposed to set up caverns at 2 more locations, namely, Chandikhole in Odisha and Bikaner in Rajasthan. This will take our strategic reserve capacity to 15.33 MMT. In solar energy, we now propose to take up the second phase of Solar Park development for additional 20,000 MW capacity. We are also creating an eco-system to make India a global hub for electronics manufacturing. Over 250 investment proposals for electronics manufacturing have been received in the last 2 years, totalling an investment of Rs1.26 lakh crores. A number of global leaders and mobile manufacturers have set up production facilities in India. I have therefore exponentially increased the allocation for incentive schemes like M-SIPS and EDF to Rs745 crores in 2017-18. This is an all-time high. We have to focus on our export infrastructure in a competitive world. A new and restructured Central scheme, namely, Trade Infrastructure for Export Scheme (TIES) will be launched in 2017-18. The total allocation for infrastructure development in 2017-18 stands at Rs3,96,135 crores. I now turn to the Financial Sector. The focus of TEC India agenda in this sector is on building stable and stronger institutions. We will continue with our reform agenda with several new measures. Our Government has already undertaken substantive reforms in FDI policy in the last two years. More than 90% of the total FDI inflows are now through the automatic route. The Foreign Investment Promotion Board (FIPB) has successfully implemented e-filing and online processing of FDI applications. We have now reached a stage where FIPB can be phased out. We have therefore decided to abolish the FIPB in 2017-18. A roadmap for the same will be announced in the next few months. In the meantime, further liberalisation of FDI policy is under consideration and necessary announcements will be made in due course. The Commodities markets require further reforms for the benefits of farmers. An expert committee will be constituted to study and promote creation of an operational and legal framework to integrate spot market and derivatives market for commodities trading. e-NAM would be an integral part of such framework. The draft bill to curtail the menace of illicit deposit schemes has been placed in the public domain and will be introduced shortly after its finalisation. There is an urgent need to protect the poor and gullible investors from another set of dubious schemes, operated by unscrupulous entities who exploit the regulatory gaps in the Multi State Cooperative Societies Act, 2002. We will amend this Act in consultation with various stakeholders, as part of our ‘Clean India’ agenda. The bill relating to resolution of financial firms will be introduced in the current Budget Session of Parliament. This will contribute to stability and resilience of our financial system. It will also protect the consumers of various financial institutions. Together with the Insolvency and Bankruptcy Code, a resolution mechanism for financial firms will ensure comprehensiveness of the resolution system in our country. I had stated in my last Budget speech that a Bill will be introduced to streamline institutional arrangements for resolution of disputes in infrastructure related construction contracts, PPP and public utility contracts. After extensive stakeholders’ consultations, we have decided that the required mechanism would be instituted as part of the Arbitration and Conciliation Act 1996. An amendment Bill will be introduced in this regard. I have also proposed several other measures in the financial sector which are listed in Annex I. Listing of Public Sector enterprises will foster greater public accountability and unlock the true value of these companies. The Government will put in place a revised mechanism and procedure to ensure time bound listing of identified CPSEs on stock exchanges. The disinvestment policy announced by me in the last budget will continue. We see opportunities to strengthen our CPSEs through consolidation, mergers and acquisitions. By these methods, the CPSEs can be integrated across the value chain of an industry. It will give them capacity to bear higher risks, avail economies of scale, take higher investment decisions and create more value for the stakeholders. Possibilities of such restructuring are visible in the oil and gas sector. We propose to create an integrated public sector ‘oil major’ which will be able to match the performance of international and domestic private sector oil and gas companies. Our ETF, comprising shares of ten CPSEs, has received overwhelming response in the recent Further Fund Offering (FFO). We will continue to use ETF as a vehicle for further disinvestment of shares. Accordingly, a new ETF with diversified CPSE stocks and other Government holdings will be launched in 2017-18. The focus on resolution of stressed legacy accounts of Banks continues. The legal framework has been strengthened to facilitate resolution, through the enactment of the Insolvency and Bankruptcy Code and the amendments to the SARFAESI and Debt Recovery Tribunal Acts. In line with the ‘Indradhanush’ roadmap, I have provided Rs10,000 crores for recapitalisation of Banks in 2017-18. Additional allocation will be provided, as may be required. Listing and trading of Security Receipts issued by a securitization company or a reconstruction company under the SARFAESI Act will be permitted in SEBI registered stock exchanges. This will enhance capital flows into the securitization industry and will particularly be helpful to deal with bank NPAs. The Pradhan Mantri Mudra Yojana has contributed significantly to funding the unfunded and the underfunded. Last year, the target of Rs1.22 lakh crores was exceeded. For 2017-18, I propose to double the lending target of 2015-16 and set it at Rs2.44 lakh crores. Priority will be given to Dalits, Tribals, Backward Classes, Minorities and Women. The Stand Up India scheme was launched by our Government in April 2016 to support Dalit, Tribal and Women entrepreneurs to set up greenfield enterprises and become job creators. Over 16,000 new enterprises have come up through this scheme in activities, as diverse as food processing, garments, diagnostic centres, etc. Already there is evidence of increased digital transactions. The BHIM app has been launched. It will unleash the power of mobile phones for digital payments and financial inclusion. 125 lakh people have adopted the BHIM app so far. The Government will launch two new schemes to promote the usage of BHIM; these are, Referral Bonus Scheme for individuals and a Cashback Scheme for merchants. Aadhar Pay, a merchant version of Aadhar Enabled Payment System, will be launched shortly. This will be specifically beneficial for those who do not have debit cards, mobile wallets and mobile phones. A Mission will be set up with a target of 2,500 crore digital transactions for 2017-18 through UPI, USSD, Aadhar Pay, IMPS and debit cards. Banks have targeted to introduce additional 10 lakh new PoS terminals by March 2017. They will be encouraged to introduce 20 lakh Aadhar based PoS by September 2017. The digital payment infrastructure and grievance handling mechanisms shall be strengthened. The focus would be on rural and semi urban areas through Post Offices, Fair Price Shops and Banking Correspondents. Steps would be taken to promote and possibly mandate petrol pumps, fertilizer depots, municipalities, Block offices, road transport offices, universities, colleges, hospitals and other institutions to have facilities for digital payments, including BHIM App. A proposal to mandate all Government receipts through digital means, beyond a prescribed limit, is under consideration. Government will strengthen the Financial Inclusion Fund to augment resources for taking up these initiatives. The Committee on Digital Payments constituted by Department of Economic Affairs has recommended structural reforms in the payment eco system, including amendments to the Payment and Settlement Systems Act, 2007. Government will undertake a comprehensive review of this Act and bring about appropriate amendments. To begin with, it is proposed to create a Payments Regulatory Board in the Reserve Bank of India by replacing the existing Board for Regulation and Supervision of Payment and Settlement Systems. Necessary amendments are proposed to this effect in the Finance Bill 2017. As we move faster on the path of digital transactions and cheque payments, we need to ensure that the payees of dishonoured cheques are able to realise the payments. Government is therefore considering the option of amending the Negotiable Instruments Act suitably. I now turn to Public Service. Our focus here is on effective government and efficient service delivery. We have made a strong beginning with regard to Direct Benefit Transfer (DBT) to LPG and kerosene consumers. Chandigarh and eight districts of Haryana have become kerosene free. 84 Government schemes have also boarded on the DBT platform. The Government e-market place which is now functional for procurement of goods and services, has been selected as one of the winners of the South Asia Procurement Innovation Awards of the World Bank. Our citizens in far flung regions of the country find it difficult to obtain passports and redress passport related grievances. We have decided to utilise the Head Post Offices as front offices for rendering passport services. Our defence forces keep the country safe from both external and internal threats. A Centralised Defence Travel System has now been developed through which travel tickets can be booked online by our soldiers and officers. They do not have to face the hassle of standing in queues with railway warrants. At present our citizens, especially those belonging to the poor and unprivileged sections, go through cumbersome procedures of Government recruitment. There are multiplicity of agencies and examinations. We propose to introduce a system of single registration and two tier system of examination. Over the years, the number of tribunals have multiplied with overlapping functions. We propose to rationalise the number of tribunals and merge tribunals wherever appropriate. In the recent past, there have been instances of big time offenders, including economic offenders, fleeing the country to escape the reach of law. We have to ensure that the law is allowed to take its own course. Government is therefore considering introduction of legislative changes, or even a new law, to confiscate the assets of such persons located within the country, till they submit to the jurisdiction of the appropriate legal forum. Needless to say that all necessary constitutional safeguards will be followed in such cases. Our Government will continue to remain committed to improve the standards of public service and transparent governance. Service to the people was the life-long commitment of the Father of the Nation, Mahatma Gandhi. As we approach, the 150th Birth Anniversary of the Mahatma, we will take all steps to celebrate it in a befitting manner. A High Level Committee under the Chairmanship of Honourable Prime Minister is proposed to be set up for the same. We will also commemorate the centenary year of Champaran Satyagrah this year. Government of India will support Government of Gujarat to commemorate 100 years of Sabarmati Ashram in 2017, in a befitting manner. 200 years ago in 1817, a valiant uprising of soldiers led by Buxi Jagabandhu took place in Khordha of Odisha. We will commemorate the same appropriately. I now turn to the fiscal situation in the context of the Budget for 2017-18. Details of allocations for important sectors and schemes and transfer of resources to States are given in Annex II of my Speech. For the first time, a consolidated Outcome Budget, covering all Ministries and Departments, is being laid along with the other Budget documents. This will improve accountability of Government expenditure. The FRBM Review Committee has given its report recently. The Committee has done an elaborate exercise and has recommended that a sustainable debt path must be the principal macro-economic anchor of our fiscal policy. The Committee has favoured Debt to GDP of 60% for the General Government by 2023, consisting of 40% for Central Government and 20% for State Governments. Within this framework, the Committee has derived and recommended 3% fiscal deficit for the next three years. The Committee has also provided for ‘Escape Clauses’, for deviations upto 0.5% of GDP, from the stipulated fiscal deficit target. Among the triggers for taking recourse to these Escape Clauses, the Committee has included “far-reaching structural reforms in the economy with unanticipated fiscal implications” as one of the factors. Although there is a strong case now to invoke this Escape Clause, I am refraining from doing so. The Report of the Committee will be carefully examined and appropriate decisions taken in due course. Nevertheless, I take note of the fiscal deficit roadmap of 3% recommended by the Committee for the next three years. I have taken into consideration the need for higher public expenditure in the context of sluggish private sector investment and slow global growth. I have kept in mind the recommendation of the Committee that a sustainable debt should be the underlying basis of prudent fiscal management. Considering all these aspects, I have pegged the fiscal deficit for 2017-18 at 3.2% of GDP and remain committed to achieve 3% in the following year. With this gradual approach, I have ensured adherence to fiscal consolidation, without compromising the requirements of public investment. I have taken due care to limit the net market borrowing of Government to Rs3.48 lakh crores after buyback, much lower than Rs4.25 lakh crores of the previous year. More importantly, the Revenue Deficit of 2.3% in BE 2016-17 stands reduced to 2.1% in the Revised Estimates. The Revenue Deficit for next year is pegged at 1.9% , against 2% mandated by the FRBM Act. It will be our endeavour to improve upon these fiscal numbers, especially the fiscal deficit, in the next year, through greater focus on quality of expenditure and higher tax realisation from the huge cash deposits in Banks, triggered by demonetisation. India’s tax to GDP ratio is very low, and the proportion of direct tax to indirect tax is not optimal from the view point of social justice. I place before you certain data to indicate that our direct tax collection is not commensurate with the income and consumption pattern of Indian economy. As against estimated 4.2 crore persons engaged in organised sector employment, the number of individuals filing return for salary income are only 1.74 crore. As against 5.6 crore informal sector individual enterprises and firms doing small business in India, the number of returns filed by this category are only 1.81 crore. Out of the 13.94 lakh companies registered in India upto 31st March, 2014, 5.97 lakh companies have filed their returns for Assessment Year 2016-17. Of the 5.97 lakh companies which have filed their returns for Assessment Year 2016-17 so far, as many as 2.76 lakh companies have shown losses or zero income. 2.85 lakh companies have shown profit before tax of less than Rs1 crore. 28,667 companies have shown profit between Rs1 crore to Rs10 crore, and only 7781 companies have profit before tax of more than Rs10 crores. 1.95 crore show income between Rs2.5 to Rs5 lakh, 52 lakh show income between Rs5 to Rs10 lakhs and only 24 lakh people show income above Rs10 lakhs. Of the 76 lakh individual assesses who declare income above Rs5 lakh, 56 lakh are in the salaried class. The number of people showing income more than Rs50 lakh in the entire country is only 1.72 lakh. We can contrast this with the fact that in the last five years, more than 1.25 crore cars have been sold, and number of Indian citizens who flew abroad, either for business or tourism, is 2 crore in the year 2015. From all these figures we can conclude that we are largely a tax non-compliant society. The predominance of cash in the economy makes it possible for the people to evade their taxes. When too many people evade taxes, the burden of their share falls on those who are honest and compliant. After the demonetisation, the preliminary analysis of data received in respect of deposits made by people in old currency presents a revealing picture. During the period 8th November to 30th December 2016, deposits between Rs2 lakh and Rs80 lakh were made in about 1.09 crore accounts with an average deposit size of Rs5.03 lakh. Deposits of more than 80 lakh were made in 1.48 lakh accounts with average deposit size of Rs3.31 crores. This data mining will help us immensely in expanding the tax net as well as increasing the revenues, which was one of the objectives of demonetisation. Madam Speaker, one of the main priorities of our Government is to eliminate the black money component from the economy. We are committed to make our taxation rates more reasonable, our tax administration more fair and expand the tax base in the country. This approach will change the colour of money. The net tax revenue of 2013-14 was Rs11.38 lakh crores. This grew by 9.4% in 2014-15 and 17% in 2015-16. As per the RE of 2016-17, we will end the year with a high growth rate of 17% for the second year in a row. Because of the serious efforts made by the Government, the rate of growth of advance tax in personal income tax in the first three quarters of the current financial is 34.8%. 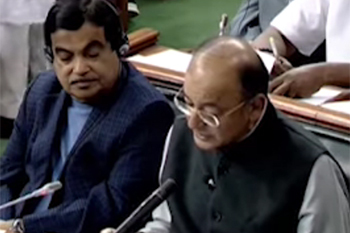 Madam Speaker, the thrust of my tax proposals in this Budget is stimulating growth, relief to middle class, affordable housing, curbing black money, promoting digital economy, transparency of political funding and simplification of tax administration. In my budget proposals last year, I had announced a scheme for profit-linked income tax exemption for promoters of affordable housing scheme which has received a very good response. However, in order to make this scheme more attractive, I propose certain changes in the scheme. First of all, instead of built up area of 30 and 60 sq.mtr., the carpet area of 30 and 60 sq.mtr. will be counted. Also the 30 sq.mtr. limit will apply only in case of municipal limits of 4 metropolitan cities while for the rest of the country including in the peripheral areas of metros, limit of 60 sq.mtr. will apply. In order to be eligible, the scheme was to be completed in 3 years after commencement. I propose to extend this period to 5 years. At present, the houses which are unoccupied after getting completion certificates are subjected to tax on notional rental income. For builders for whom constructed buildings are stock-in-trade, I propose to apply this rule only after one year of the end of the year in which completion certificate is received so that they get some breathing time for liquidating their inventory. We also propose to make a number of changes in the capital gain taxation provisions in respect of land and building. The holding period for considering gain from immovable property to be long term is 3 years now. This is proposed to be reduced to 2 years. Also, the base year for indexation is proposed to be shifted from 1.4.1981 to 1.4.2001 for all classes of assets including immovable property. This move will significantly reduce the capital gain tax liability while encouraging the mobility of assets. We also plan to extend the basket of financial instruments in which the capital gains can be invested without payment of tax. The new capital for State of Andhra Pradesh is being constructed by innovative land-pooling mechanism without use of the Land Acquisition Act. I propose to exempt from capital gain tax, persons holding land on 2.6.2014, the date on which the State of Andhra Pradesh was reorganised, and whose land is being pooled for creation of capital city under the Government scheme. A concessional with-holding rate of 5% is being charged on interest earned by foreign entities in external commercial borrowings or in bonds and Government securities. This concession is available till 30.6.2017. I propose to extend it to 30.6.2020. This benefit is also extended to Rupee Denominated (Masala) Bonds. The Government gave income tax exemptions to start-ups with certain conditions last year. For the purpose of carry forward of losses in respect of such start-ups, the condition of continuous holding of 51% of voting rights has been relaxed subject to the condition that the holding of the original promoter/promoters continues. Also the profit linked deduction available to the start-ups for 3 years out of 5 years is being changed to 3 years out of 7 years. Minimum Alternate Tax is at present levied as an advance tax. There is a strong demand for abolition of MAT. Although the plan for phasing out of exemptions will kick in from 1.4.2017, the full benefit of revenue out of phase-out will be available to Government only after 7 to 10 years when all those who are already availing exemptions at present complete their period of availment. Therefore, it is not practical to remove or reduce MAT at present. However, in order to allow companies to use MAT credit in future years, I propose to allow carry forward of MAT upto a period of 15 years instead of 10 years at present. In my Budget proposals in 2015, I had announced that I would be bringing the corporate income tax rate down to 25% gradually. In 2016 Budget, I had announced a reduction by 1% in case of those companies whose turnover is less than Rs5 crore. In the same Budget, I had also announced that new manufacturing companies who do not avail of any exemption would be charged only 25% income tax. Medium and Small Enterprises occupy bulk of economic activities and are also instrumental in providing maximum employment to people. However, since they do not get many exemptions, they end up paying more taxes as compared to large companies. As per data of financial year 2015-16, 2.85 lakh companies making profit of less than Rs1 crore pay effective tax rate of 30.26% while 298 companies making profit above Rs500 crores pay effective tax rate of 25.90%. In order to make MSME companies more viable and also to encourage firms to migrate to company format, I propose to reduce the income tax for smaller companies with annual turnover upto Rs50 crore to 25%. As per data of Assessment Year 2015-16, there are 6.94 lakh companies filing returns of which 6.67 lakh companies fall in this category and, therefore, percentage-wise 96% of companies will get this benefit of lower taxation. This will make our MSME sector more competitive as compared to large companies. The revenue forgone estimate for this measure is expected to be Rs7,200 crore per annum. In order to give a boost to banking sector, I propose to increase allowable provision for Non-Performing Asset from 7.5% to 8.5%. This will reduce the tax liability of banks. I also propose to tax interest receivable on actual receipt instead of accrual basis in respect of NPA accounts of all non- scheduled cooperative banks also at par with scheduled banks. This will remove hardship of having to pay tax even when interest income is not realised. Considering the wide range of use of LNG as fuel as well as feed stock for petro-chemicals sector, I propose to reduce the basic customs duty on LNG from 5% to 2.5%. In order to incentivise domestic value addition and to promote Make in India, I propose to make changes in Customs & Central Excise duties in respect of certain items which are given in the Annex III of this speech. Some of these proposals are also for addressing duty inversion. There is a scheme of presumptive income tax for small and medium tax payers whose turnover is upto Rs2 crores. At present, 8% of their turnover is counted as presumptive income. I propose to make this 6% in respect of turnover which is received by non-cash means. This benefit will be applicable for transactions undertaken in the current year also. I propose to limit the cash expenditure allowable as deduction, both for revenue as well as capital expenditure, to Rs10,000. Similarly, the limit of cash donation which can be received by a charitable trust is being reduced from Rs10,000/- to Rs2000/-. The Special Investigation Team (SIT) set up by the Government for black money has suggested that no transaction above Rs3 lakh should be permitted in cash. The Government has decided to accept this proposal. Suitable amendment to the Income-tax Act is proposed in the Finance Bill for enforcing this decision. To promote cashless transactions, I propose to exempt BCD, Excise/CV duty and SAD on miniaturised POS card reader for m-POS, micro ATM standards version 1.5.1, Finger Print Readers/Scanners and Iris Scanners. Simultaneously, I also propose to exempt parts and components for manufacture of such devices, so as to encourage domestic manufacturing of these devices. India is the world’s largest democracy. Political parties are an essential ingredient of a multi-party Parliamentary democracy. Even 70 years after Independence, the country has not been able to evolve a transparent method of funding political parties which is vital to the system of free and fair elections. An attempt was made in the past by amending the provisions of the Representation of Peoples Act, the Companies Act and the Income Tax Act to incentivise donations by individuals, partnership firms, HUFs and companies to political parties. Both the donor and the donee were granted exemption from payment of tax if the accounts were transparently maintained and returns were filed with the competent authorities. Additionally, a list of donors who contributed more than Rs20,000/- to any party in cash or cheque is required to be maintained. The situation has only marginally improved since these provisions were brought into force. Political parties continue to receive most of their funds through anonymous donations which are shown in cash. In accordance with the suggestion made by the Election Commission, the maximum amount of cash donation that a political party can receive will be Rs2000/- from one person. As an additional step, an amendment is being proposed to the Reserve Bank of India Act to enable the issuance of electoral bonds in accordance with a scheme that the Government of India would frame in this regard. Under this scheme, a donor could purchase bonds from authorised banks against cheque and digital payments only. They shall be redeemable only in the designated account of a registered political party. These bonds will be redeemable within the prescribed time limit from issuance of bond. Every political party would have to file its return within the time prescribed in accordance with the provision of the Income-tax Act. As an anti-avoidance measure, the provision of domestic transfer pricing in respect of related entities was brought in the Finance Act of 2012. Since then the number of entities being covered under domestic pricing has gone up substantially necessitating a longer scrutiny, which causes hardship to domestic companies. In order to reduce the compliance burden due to domestic transfer pricing provisions, I propose to restrict the scope of domestic transfer pricing only if one of the entities involved in related party transaction enjoys specified profit-linked deduction. I propose to increase the threshold limit for audit of business entities who opt for presumptive income scheme from Rs1 crore to Rs2 crores. Similarly, the threshold for maintenance of books for individuals and HUF is being increased from turnover of Rs10 lakhs to Rs25 lakhs or income from Rs1.2 lakhs to Rs2.5 lakhs. In 2012, Income-tax Act was amended to provide for taxation of those transactions of transfer of shares or interest in a foreign entity deriving its value substantially from Indian assets. Apprehensions have been raised about some difficulties which arise because of this provision in case of transfer of stake of investors of India-based funds located abroad but investing in India-based companies. In order to remove this difficulty, I propose to exempt Foreign Portfolio Investor (FPI) Category I & II from indirect transfer provision. I also propose to issue a clarification that indirect transfer provision shall not apply in case of redemption of shares or interests outside India as a result of or arising out of redemption or sale of investment in India which is chargeable to tax in India. As on today, a TDS of 5% is being deducted from commission payable to individual insurance agents even if the income of some of them may be below taxable limit. I propose to exempt them from the requirement of TDS subject to their filing a self-declaration that their income is below taxable limit. Last year, I had announced a new scheme for presumptive taxation for professionals with receipt upto Rs50 lakhs p.a. In respect of such assesses, they are being given further benefit in terms of paying advance tax in one instalment instead of four. In order to allow the people to claim the refund expeditiously, the time period for revising a tax return is being reduced to 12 months from completion of financial year, at par with the time period for filing of return. Also the time for completion of scrutiny assessments is being compressed further from 21 months to 18 months for Assessment Year 2018-19 and further to 12 months for Assessment Year 2019-20 and thereafter. While the Government is trying to bring within tax-net more people who are evading taxes, the present burden of taxation is mainly on honest tax payers and salaried employees who are showing their income correctly. Therefore, post-demonetisation, there is a legitimate expectation of this class of people to reduce their burden of taxation. Also an argument is made that if a nominal rate of taxation is kept for lower slab, many more people will prefer to come within the tax net. I, therefore, propose to reduce the existing rate of taxation for individual assesses between income of Rs2.5 lakhs to Rs5 lakhs to 5% from the present rate of 10%. This would reduce the tax liability of all persons below Rs5 lakh income either to zero (with rebate) or 50% of their existing liability. In order not to have duplication of benefit, the existing benefit of rebate available to the same group of beneficiaries is being reduced to Rs2500 available only to assessees upto income of Rs3.5 lakhs. The combined effect of both these measures will mean that there would be zero tax liability for people getting income upto Rs3 lakhs p.a. and the tax liability will only be Rs2,500 for people with income between Rs3 and Rs3.5 lakhs. If the limit of Rs1.5 lakh under Section 80C for investment is used fully the tax would be zero for people with income of Rs4.5 lakhs. While the taxation liability of people with income upto Rs5 lakhs is being reduced to half, all the other categories of tax payers in the subsequent slabs will also get a uniform benefit of Rs12,500/- per person. The total amount of tax foregone on account of this measure is Rs15,500 crores. In order to make good some of this revenue loss on account of this relief, I propose to levy a surcharge of 10% of tax payable on categories of individuals whose annual taxable income is between Rs50 lakhs and Rs1 crore. The existing surcharge of 15% of Tax on people earning more than Rs1 crore will continue. This is likely to give additional revenue of Rs2,700 crores. In order to expand tax net, I also plan to have a simple one-page form to be filed as Income Tax Return for the category of individuals having taxable income upto Rs5 lakhs other than business income. Also a person of this category who files income tax return for the first time would not be subjected to any scrutiny in the first year unless there is specific information available with the Department regarding his high value transaction. I appeal to all citizens of India to contribute to Nation Building by making a small payment of 5% tax if their income is falling in the lowest slab of Rs2.5 lakhs to Rs5 lakhs. Some other important proposals for amendment in Tax Laws which are not covered by me in my speech are given in Annex III of this speech. There has been substantial progress towards ushering in GST, by far, the biggest tax reform since independence. Since the enactment of the Constitution (One Hundred and First Amendment) Act, 2016, the preparatory work for this path-breaking reform has been a top priority for the Government. In this context, several teams of officers both from the States and Central Board of Excise and Customs have been working tirelessly to give finishing touch to the Model GST law and rules and other details. Government on its part has promptly given effect to various provisions of the Constitutional Amendment Act, including constitution of the GST Council. Since then, the GST Council held 9 meetings to discuss various issues relating to GST, including broad contours of the GST rate structure, threshold exemption and parameters for composition scheme, details for compensation to States due to implementation of GST, examination of draft model GST law, draft IGST law and the Compensation Law and administrative mechanism for GST. It is my privilege to inform this august house that the GST Council has finalised its recommendations on almost all the issues based on consensus and after spirited debate and discussions. The preparation of IT system for GST is also on schedule. The extensive reach-out efforts to trade and industry for GST will start from 1st April, 2017 to make them aware of the new taxation system. Centre, through the Central Board of Excise & Customs, shall continue to strive to achieve the goal of implementation of GST as per schedule without compromising the spirit of co-operative federalism. Implementation of GST is likely to bring more taxes both to Central and State Governments because of widening of tax net. I have preferred not to make many changes in current regime of Excise & Service Tax because the same are to be replaced by GST soon. In the Annual Conclave of Tax officers called ‘Rajaswa Gyan Sangam’ held in June 2016, the Prime Minister had expressed his desire to bring reforms in tax administration in the form of an approach of RAPID which stands for Revenue, Accountability, Probity, Information and Digitisation. This approach precisely reflects the strategy of Tax Department which is now formulated. While revenue considerations always remain the focus of Revenue Department, we are trying to bring in maximum use of Information Technology to remove human contact with assesses as well as to plug tax avoidance. We will try to maximise our efforts for e-assessment in the coming year. We are also using a lot of data mining capability, both in-house and outsourced. We plan to enforce greater accountability of officers of Tax Department for specific act of commission and omission. I would like to assure everyone that honest, tax-compliant person would be treated with dignity and courtesy. Madam Speaker, my direct tax proposals for exemptions, etc. would result in revenue loss of Rs22,700 crore but after counting for revenue gain of Rs2,700 crore for additional resource mobilisation proposal, the net revenue loss in direct tax would come to Rs20,000 crore. There is no significant loss or gain in my indirect tax proposals. Madam Speaker, I have outlined the Budget proposals under our overarching agenda: “Transform, Energise and Clean India”. Our emphasis will now be on implementing all these proposals for the benefit of the farmers, the poor and the underprivileged sections of our society. Madam Speaker, it is said: “When my aim is right, when my goal is in sight, the winds favour me and I fly”. There is no other day, which is more appropriate for this, than today.